It’s been a busy few months for Holestone Young Farmers’ Club packed with club meetings, outings and competitions. March saw the club host a ‘Network for youth-Have Your Say’ event which provided a great opportunity for local young farmers to get their voices heard within the community. The club also achieved success at county level with Robyn McConnell awarded third place in junior member of the year and Laura Patterson awarded both second place in senior member of the year and first place in most efficient secretary. Club members were also placed in the county dairy stock judging heats held at Patterson’s farm with Robyn Marshall gaining first place and Jack Patterson gaining second place in their respective age groups. Tuesday, April 11th saw Holestone YFC’s busy winter programme brought to a close with their annual parents’ and friends’ evening. The club were delighted to welcome one of their vice presidents and former RUAS president, Billy Robson OBE as guest speaker for the evening. A very enjoyable evening was had by all and the club would like to thank all parents and friends for their support on the evening and also throughout the year. 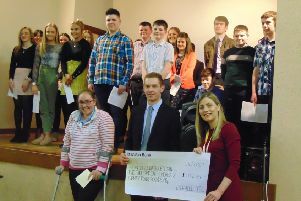 Club members also recently headed to Ballymoney High School to perform their One Act Drama of ‘The Church Meeting’. After a few busy months of practising, all the hard work paid off and the club put on a fantastic performance. Congratulations must go to all members who were involved and also to the producers for all their help along the way. Despite the end of the winter programme, the summer season will be as busy as ever for the club, with sports nights, shows and barbecues. Upcoming events include the club’s annual sports night on Friday, May 19th and annual barbecue on Saturday, July 1.